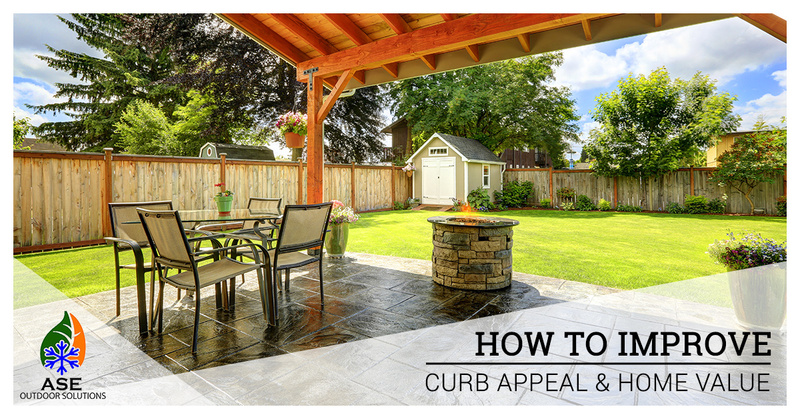 How To Improve Curb Appeal & Home Value | ASE Outdoor Solutions - Lawn Care, Landscaping & More! Chances are your home is probably the most expensive thing you own. And, unfortunately, for most of us, the spending doesn’t stop once we purchase a home. Oh no, it’s just beginning. Every year, Americans spend billions of dollars fixing up their homes. While many of these efforts are rewarded with added comfort and increased home value, not all of these investments are wise. In today’s blog post, we at ASE Outdoor Solutions would like to share with you some simple and relatively inexpensive outdoor investments that can significantly increase your home’s value. Whether it’s covering up some bare spots, adding new landscaping, or building a deck, landscaping efforts offer a reliable way of improving your property’s value. In fact, according to the Professional Lawn Care Association of America, homeowners who invest in their landscaping see around 15 percent of an increase in their home value — not bad. Looking for a reliable lawn care company to perform your summer lawn maintenance, give us a call today at 330-299-4404! We also can perform lawn installs, mulching services, deck building, and more! Contact us here and view out our services here! Below are some potential summer projects to enhance your home’s value. Enrolling in a standard lawn care program is a surefire way to boost your home’s value. This program will likely include fertilizer applications, weed control, lawn mowing, and more. Not only does a great lawn allow your home to make a great first impression on visitors, but it also can improve your home value and offer a great return on investment. If the area around your home is boring and bare, consider incorporating some color by adding flowering shrubs and trees. A good rule of thumb when laying out your landscaping is to cover all seasons, meaning choose plants that will give you continuous color, texture, and smell. If you are unsure what to plant or where to plant, contact your local landscaping company. Another way of boosting your curb appeal is to add some hardscaping. Walkways, fireplaces, rock gardens, and ponds are all great ways of adding some intrigue and beauty to your outdoor space. Not only does hardscaping look nice, but many features, like fireplaces, for example, help create a comfortable outdoor space where you can enjoy spending time. At ASE Outdoor Solutions, we understand that hardscaping elements should be unique to each homeowner. This is why we work with our clients to build custom projects tailored to fit their desired goals. For those who love to spend time outside of the house, decks and patios are ideal. When the weather is nice, decks and patios give you a designated outdoor space for hanging out and entertaining guests. Not only will decks enhance your home’s curb appeal, but they can also increase the value of your home if you ever want to sell. Homebuyers are always looking for a nice family-oriented outdoor space that comes with the home. On top of all of this, decks and patios will give you extra space. Good deck builders are able to make the deck a seamless extension of your home. Compared to other home renovations, deck building can be relatively inexpensive, making it a great option for homeowners who want to add value to their home while keeping to a budget. If you are in the Barberton or Akron area and are in need of lawn care, landscaping, deck building, hardscaping, or more, give us a call today at 330-299-4404! We take tremendous pride in serving the Akron area, and being your go-to company for all of your outdoor solutions!